In Identity, a short book based on an email exchange between Zygmunt Bauman and Italian journalist Benedetto Vecchi, the sociologist discusses the question of identity in the context of what he calls ‘liquid modernity’. Bauman’s thesis is that we have moved from a solid to a fluid phase of modernity, in which nothing keeps its shape, and social forms are constantly changing at great speed, radically transforming the experience of being human. The idea of liquid modernity could be seen as Bauman’s attempt to resolve the tension that exists in much social theory between explaining social phenomena as aspects of modernity, and accounting for their appearance only recently. After all, the modern condition, with its overturning of tradition, has dominated the past two centuries. Liquid modernity seems perhaps to be the late realisation of a tendency that has characterised modernity from the start. What remains at issue is whether the ‘solid’ institutions of prior modernity were merely the residue of tradition, or pointed towards a more enduring potential of modernity itself. Most pertinently, is the rational self-determining subject of modernity any more than an illusion that has had its day? Inevitably, the undermining of familiar institutions, an aspect of modernity that has certainly been intensified in recent years, has had important consequences for people’s sense of identity. There is nothing new about the observation that national and class-based identities (both of which had seemed almost definitively modern) have been upset by the end of the Cold War and various other developments discussed under the heading of ‘globalisation’. Similarly, Bauman notes that while the workplace was traditionally a very important source of personal identity, changes in the economy have rendered it far less reliable. He suggests that the enduring identities once associated with work have given way to looser and more provisional identities, and conceptions of community, that are subject to constant change and renegotiation. Indeed, Bauman points to a more profound transformation of how we understand what it means to be human in the absence of transcendent ideologies (traditional or otherwise) such as have characterised modernity until recently. The liquidity of which Bauman writes is nowhere more evident than in his own writing, which, even when not based on email, tends of late to be aphoristic, even whimsical. Reading Liquid Love (2003) is not so much like taking an academic course with Professor Bauman, as being stuck in a lift with him after a particularly well-catered social function, perhaps having set the old man off with an ill-judged confession of new love or a broken heart. ‘Ah, love…’ Nonetheless, it is in the context of personal relationships (especially what Vecchi quaintly calls ‘amorous relationships’), that Bauman is most insightful. What do these represent in the absence of a traditional framework within which to make sense of them. Is there indeed any basis for enduring relationships if we dispense with traditional notions of duty, responsibility and self-sacrifice? In Identity, Bauman cites French philosopher Michel Serres’ nomination of Don Juan as the first hero of modernity, delighting in spontaneity and inconstancy. ‘The strategy of carpe diem is a response to a world emptied of values pretending to be lasting,’ Bauman suggests. The strategy is well captured in Penny Woolcock’s 2003 film The Principles of Lust, in which the protagonist is attracted to a demonic character who rejects commitment of any kind and lives by a credo of instant and disposable gratification. That film’s lack of success may indicate that Don Juan has lost his glamour as his worldview has become too real. As Bauman notes, ‘Most of us, most of the time, are in two minds about that novelty of “bond-free living” – of relationships “with no strings attached”. We covet them and fear them at the same time.’ The flipside of freedom from ties rooted in social convention is a lack of guarantees, and a heightened consciouness of the risk involved in relationships. Bauman refers to the old idea that to love someone means giving a hostage to fortune, but what he goes on to describe is very different from Francis Bacon’s famous and essentially pre-modern observation (borrowing in fact from the Latin poet Lucan): ‘He that hath wife and children hath given hostages to fortune; for they are impediments to great enterprises, either of virtue or mischief’. What Bauman means is not simply that the object of one’s affections is vulnerable, and therefore a liability, but that in modernity the object of one’s affections is also a subject. Loving a subject means ‘making oneself dependent on another person endowed with a similar freedom to choose and the will to follow that choice – and so a person full of surprises, unpredictable.’ That person’s surprising choices can be painful. In the absence of the guarantees offered by tradition, the whole enterprise of commitment is fundamentally unilateral, and consequently precarious. Traditional marriage, in contrast, meant staying together ‘through thick and thin’ for the sake of convention rooted in practicality, rather than as a fully autonomous decision. Bourgeois marriage is, or was, emblematic of ‘solid modernity’, combining, never quite satisfactorily, traditional function with an ideal of free choice. That tension between practicality and romance is not resolved in ‘liquid modernity’, merely disenchanted. Where subjectivity is unconstrained by tradition, then, it is instead inhibited by uncertainty. Dea Birkett argued recently in the Guardian: ‘Falling in and out of love is unpredictable. Promising to love someone forever is a promise no honest person would make.’ But this apparent hard-headed realism is really the flipside of sentimentality. Both attitudes abandon responsibility to the Fates, casting love as a mere subjective feeling rather than, as it might be, a rational determination. True, feelings change, but decisions can affect the way they change. If we are rationally convinced of something, rather than simply following a whim, we can put ourselves in situations more amenable to some feelings than others, and wait out the bad days (precisely because we interpret them as such, rather than as changes of mind). Arguably, this is the first time we have been able to make such risky commitments autonomously, not to be defined by others, but to choose to define ourselves through others – and not just in personal relationships. This is very different from the traditional taken-for-granted character of commitment-identities. With the disenchantment of marriage, the rationality of relations between human subjects is revealed. But this doesn’t make them any simpler or less risky; in fact, in the current context it seems to have inspired a calculating cynicism. Why choose to constrain oneself? Faced with an unexpected turn in a relationship, the easiest thing to do is to reinterpret one’s earlier commitment as a mistake, and ‘move on’. This kind of reinterpretation of past commitments has obvious consequences for identity, however. Bauman mentions in passing another French philosopher Paul Ricoeur’s terms, la mêmete (sameness) to describe consistency of self over time, and l’ipseite (selfness) to describe what distinguishes us from others. His contention is that both categories are increasingly problematic in ‘liquid modernity’. Certainly, these are less ‘given’ than in the past. There is no overbearing social script dictating how we should live our lives, and placing individual biographies in the context of a greater whole. Tradition is a collection of disenchanted stories with little grip on our lives. Modernity, or ‘solid modernity’ can be understood as one more such disenchanted story, but this to miss what is unique about it; that it requires not enchantment but active commitment. The modern ideal of rational self-determining subjects is indeed a script of sorts, but one which allows, indeed requires, people to take authorship. This implies a subjective commitment to particular goals and even institutions that embody those goals. What Bauman calls liquid modernity is a consequence of the failure of the ‘grand narratives’ of modernity, most obviously nationalism and socialism. (In that sense, of course, his theory is a more graphic variant of postmodernism.) This failure has cast doubt on possibility of subjective, voluntaristic narratives as much as traditionally imposed ones. In an essay in the Times Literary Supplement (15 October 2004), the paper’s philosophy editor Galen Strawson challenged the idea that ‘narrativity’ is necessary to ‘the good life’, essentially arguing that it is irrational to insist on la mêmete. Why not just accept that we change over time, and decisions we make at one point will seem inappropriate or plain silly further down the line? On an individual psychological level, this makes sense. In many senses, the ‘me’ of now bears little relation to the ‘me’ of several years ago. Strawson says he doesn’t mind whether ‘he’ endures into the future. I think I’d rather ‘I’ did, albeit bigger and better. In fact, Strawson describes two distinct psychological types to account for this, which he calls diachronic and episodic. The former is given to narrative; the latter is not, and Strawson insists that while each type is disturbed and confused by the alternative disposition, neither is ethically superior. Strawson lists writers who conform to each type. These span the ages: the episodics go back as far as Michel de Montaigne and the Earl of Shaftesbury and up to AJ Ayer and Bob Dylan, while the diachronics include Plato, Augustine, Heidegger and Patrick O’Brian. Nonetheless, narrative thinking has surely characterised certain historical periods and societies more than others, and Strawson’s attitude does seem particularly contemporary. It is, perhaps, an outlook peculiarly suited to Bauman’s liquid modernity. At a time when it is difficult to sustain a coherent identity over time, it is reassuring to be told that it doesn’t matter. Instead of lamenting the absence of stories through which to make sense of our lives, we should celebrate our liberation from narrative (not to mention metanarrative) and get on with our lives-es. AC Grayling recently argued similarly in The Liberal magazine (December 2004) ‘against monogamy’ on the grounds that people change and it would be cruel to force people to persist in unhappy marriages. In fact, this was an argument for (retaining) legal divorce and (continuing to allow) remarriage rather than against monogamy. It is telling that Grayling seems unable to imagine what monogamy might mean if not legal enforcement of marriage vows. He posits a peculiar weak version of the individual, a flighty creature cruelly ensnared by the authoritarian institution of marriage. But this is a caricature even of marriage in traditional society. Individuals can actually choose to define themselves through social institutions such as monogamy. It is perfectly consistent to oppose the legal enforcement of marriage vows, then, while endorsing the idea of monogamy, either as a social good or as an individual choice. Indeed, it is at this level, rather than that of state coercion, that such institutions are actually constituted. Whether or not one does believe in monogamy, to oppose it on the grounds that it is necessarily coercive is to underestimate human beings’ capacity to determine their own lives, both as individuals and through cultural norms and aspirations shared with others. Dea Birkett’s insistence that ‘no honest person’ would commit for life reduces a solemn determination to a wild and surely inaccurate guess. In this former sense, however, ‘narrative’ offers the possibility not just of describing and giving meaning to our lives, but of shaping and giving direction to our lives. Not so paradoxically, then, the demise of social narrative has not led to greater individual freedom, but to unreflective conformism to what is considered to be human nature. 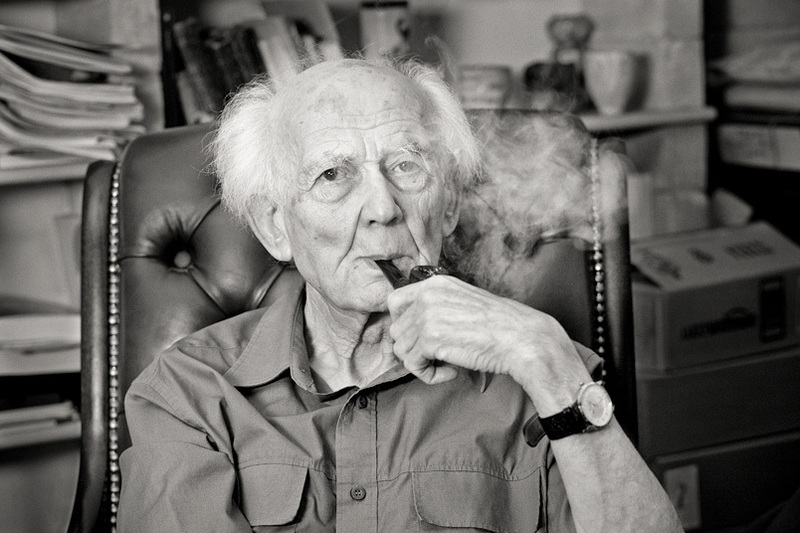 For Bauman, mere humanism offers no foundation for lasting values. ‘Like all other postulated identities, “humanity” as an identity embracing all other identities can ultimately rely solely on the dedication of its postulated adherents.’ This is perfectly true, and the frailty of such concepts as ‘human rights’ is all too evident, but arguably this is because, like Grayling’s humanism, these tend to portray human beings as fundamentally vulnerable. If the postulated adherents of contemporary humanism cannot even make decisions about their personal lives, their dedication to any identity embracing all other identities has to be in question too. Nonetheless, this is not the only way to think about humanism. The dedication of adherents to the institutions of what Bauman calls solid modernity was not soley based on values borrowed from tradition or religion, but reflected genuine shared interests and solidarities rooted in the material world. While there has undeniably been a great deal of change in the world, it is questionable whether things have altered so fundamentally that those solidarites, and the identities based on them, are no longer imaginable. The peculiar ‘liquidity’ of our times may be less the consequence of structural change than intellectual exhaustion, the failure of the great ideologies of the twentieth century to bring about change on a scale that really would transform what it means to be human. Bauman rightly warns against attempts to seek refuge in the identities of the past, but in his lament at the passing of lasting values, he perhaps underestimates the possibilities for self-assured human beings unencumbered by the past, and brave enough to face the future.